The Sarawak government's continued support for Putrajaya hinges on the Federal government accepting the motion. KUCHING: Article 1(2) of the Federal Constitution could be amended if there’s a strong motion from Sarawak that will compel the Federal government to table a Bill on the matter in Parliament, Batu Lintang Assemblyman See Chee How said at a press conference yesterday. He was referring to the status of Sabah and Sarawak in the Federation under the Malaysia Agreement 1963 (MA63). See said that if there’s no such Bill pushed through by the government, then any MP can put in a Private Member’s Bill on the amendment, The Borneo Post reported today. 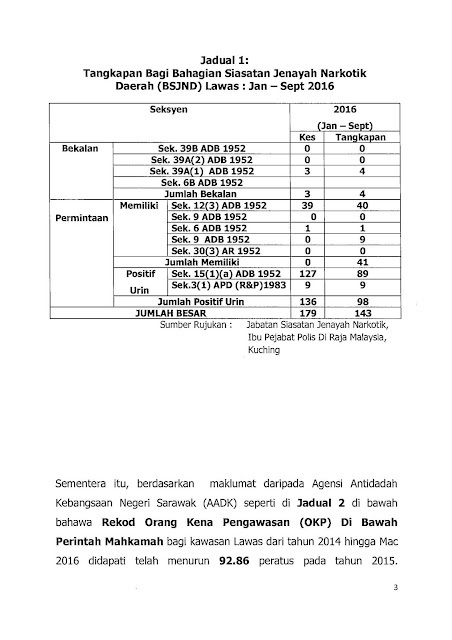 If the Sarawak Assembly reaches a unanimous motion on the matter, and Putrajaya does nothing, then the Sarawak government can no longer continue to support the Federal government, added See who is Sarawak PKR vice-chairman and a lawyer. 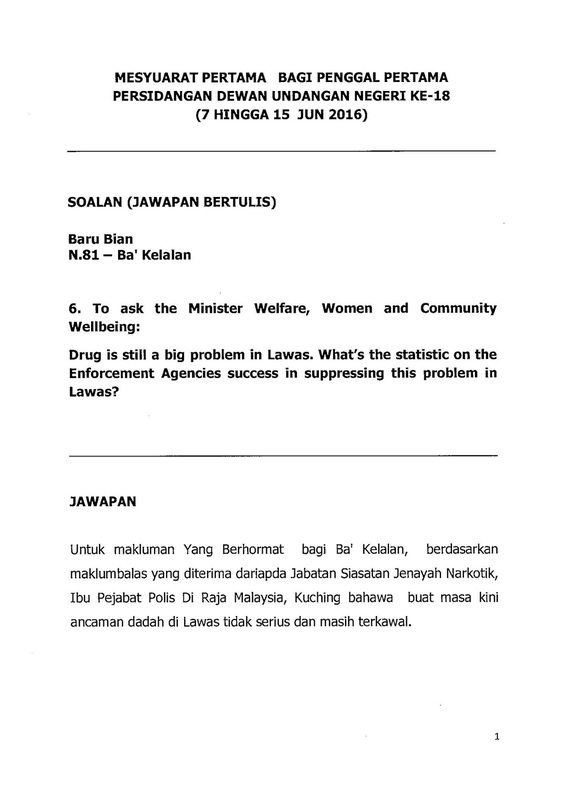 See said the motion, to be introduced in the Sarawak Assembly next month, was very significant. “It will send a strong message to the Federal government,” he was quoted as saying by the Sarawak-based daily. See also said that he was happy Chief Minister Adenan Satem had confirmed the Sarawak government would be introducing the motion in the state assembly. He said it would be ideal if there was a bi-partisan committee to draft the motion but so far there has been no such development. “That’s why the opposition will be filing a motion as well despite Adenan’s announcement on it. He said the opposition would support the government’s motion if it concerns the territory and rights of Sarawak under MA63, the Inter-Governmental Committee Report and the Cobbold Commission Report. See went on to remind that the 13 July 1976 amendment to Article 1(2) in Parliament was a breach of MA63. See also called MA63 an international agreement and treaty signed by five governments and lodged with the UN Secretary-General. MA63 was signed by North Borneo, Sarawak, Singapore, Malaya and the United Kingdom. However, the jury is still out on whether it was a Trust Deed as well given the fact that the process of decolonisation was not completed in Borneo in 1963. Before 13 July 1976, Sabah and Sarawak were equal partners of Malaya in the Federation of Malaysia (not Malaya). After the amendment, Sabah and Sarawak, according to the Federal Constitution, became the 12th and 13th states in the Federation of Malaya (now Malaysia). Article 160 of the Federal Constitution defines “Federation” as that set up by the Federation of Malaya Agreement 1948 and reinforced by the Federation of Malaya Independence Act 1957. State Minister for Welfare, Women and Community Wellbeing Fatimah Abdullah is concerned that the target of having locals make up 90 per cent of teachers in the state will not be met. KUCHING: Sarawak is in danger of not achieving its target of having 90 per cent local teachers in the state by 2018 after it was announced that three teaching colleges will be closed down, state officials said. Minister for Welfare, Women and Community Wellbeing Fatimah Abdullah , who also oversees education in Sarawak, complained she was not consulted on the closure which will leave IPG Batu Lintang as the only full-fledged teachers’ training college in the state. Institut Pendidikan Guru (IPG) Miri, IPG Rejang and IPG Samarahan are the three colleges in Sarawak which will be closed down as announced by Prime Minister Najib Razak in his Budget 2017 speech last week. Nine teaching colleges nationwide would be converted into polytechnic and vocational colleges. “We were not consulted on the matter. All directors (of IPG in Sarawak) were called and briefed in Kuala Lumpur,” Fatimah told the Borneo Post. Fatimah first learnt of the “fate” of the nine teaching colleges on the sidelines of the International Conference on Education in Miri recently. Still, she said, there appears to be some confusion on the situation of the three colleges in Sarawak. 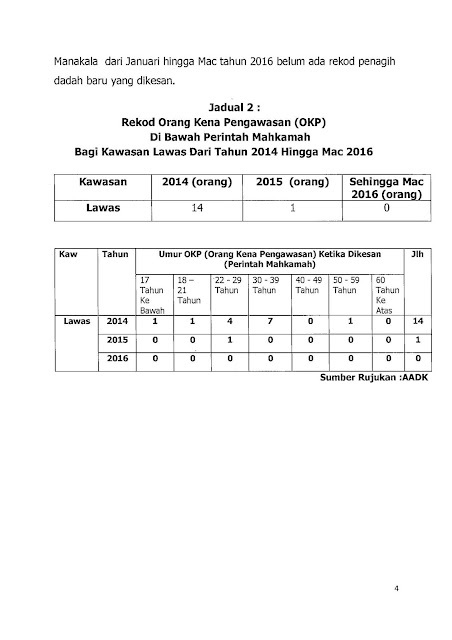 IPG Samarahan no longer takes in trainee teachers. The Minister, in welcoming Putrajaya’s emphasis on developing a skilled workforce in Sarawak, feels this should be done without closing down teaching colleges. Sarawak Teachers’ Union president Jisin Nyuk echoed Fatimah’s comments. Without the three teachers training colleges, he warned, “we can’t achieve the 90:10 policy by 2018″. He urged Putrajaya to abort this plan, adding that this matter should have been discussed with the colleges concerned. Prominent activist lawyer refers to Standing Order protecting MPs, criticises Speaker for giving irrelevant legal opinions outside over Muhyiddin, Husni's speeches. PETALING JAYA: Prominent activist lawyer Azhar Harun has called Pandikar Amin Mulia out for reprimanding former ministers over breaching the oath of secrecy in the Dewan Rakyat with respect to “Cabinet information”. Writing in his Facebook account today, Azhar, who is more popularly known as Art, said that the Dewan Rakyat Speaker lacks understanding on “the law and inner workings of parliamentary democracy”. “Pandikar Amin Mulia’s comment that Muhyiddin Yassin and Ahmad Husni Hanadzlah may have breached the law as well as their oath of secrecy while debating the budget in the Parliament brings into sharp focus the warp-ish understanding of the law and the inner workings of parliamentary democracy residing within some of the people who are actually entrusted to uphold the law and parliamentary democracy in our country,” Art said. Pandikar had last week chided the former deputy prime minister and the former second finance minister over speeches that he (Pandikar) said needed caution as there “are certain acts like the OSA and Sedition Act”. “It is all there, so I advise that although you know something, you need to be careful there is Standing Order 36(12) and so we need to keep certain things in confidence,” Pandikar had reportedly told Parti Pribumi Bersatu Malaysia pro-tem president Muhyiddin, and Husni, who quit his Barisan Nasional and Umno treasurer posts after being dropped from the Cabinet in June this year. Art’s attack on Pandikar stemmed from the fact that Pandikar was not present on the day last week that Muhyiddin debated the Budget 2017 tabled by Prime Minister Najib Razak on Oct 21. “The Deputy Speaker, in all his wisdom, did not at any time stop Muhyiddin from delivering his speech. Nor did the Deputy Speaker refer him to any standing order that had been breached or about to be breached by him during his speech,” Art said adding that Pandikar should protect the sanctity of the House and the rights of all MPs, instead of offering legal opinions outside the House. “That is the Constitutional protection accorded to every person who speaks or votes while participating in the proceedings of the House. That protection is almost absolute. “The protection can only be displaced if the person is charged under certain laws, namely, the Sedition Act and laws that are passed in accordance with Article 10(4),” which Art reminded had not been touched on or breached during Muhyiddin’s speech. Like many prominent legal observers before him, not to mention political activists, Art too called into question the validity of the OSA and its blanket prohibition on “Cabinet documents, records of decisions and deliberations including those of Cabinet committees”. “Freedom of speech and expression is a right of every citizen. This right is guaranteed by Article 10 (1) of the Federal Constitution. The answer lies in Article 10(2)(a), according to Art. d) restrictions designed to protect the privileges of Parliament or of any Legislative Assembly or to provide against contempt of court, defamation, or incitement to any offence. “The OSA is a piece of law that restricts freedom of speech and expression. Being so, the OSA must conform to Article 10(1) and (2). It cannot supersede those Articles. “That is because the Federal Constitution is the supreme law of the land and thus all other laws must not be repugnant against any of its provisions. “If laws are passed that exceeds the powers given by the Federal Constitution, those laws are ultra vires the Federal Constitution. Any law that is ultra vires the Constitution is therefore invalid and void to that extent,” Art said. He added that the schedule under the OSA should have listed “Cabinet documents and records of decisions and deliberations in respect of the security of Malaysia”. “The implications of a blanket ban on ‘Cabinet documents, records of decisions and deliberations including those of Cabinet committees” also means that even discussions on flood mitigation plans, the rate of toll or any other matters that has nothing to do with those matters in Article 10(2)(a), the OSA seeks to make them secret. The news about the latest land dispute death came as a shock to me. This incident 4 months after the murder of Bill Kayong serves to remind us that many native landowners are still facing problems with plantation and timber companies. This time the victim appears to be from the company’s side but the issue is that lives are being lost unnecessarily because of government policies which impact the native community’s life and livelihood. We have been asking for many years for the Sarawak government to abide by the ruling of the courts and recognise that pemakai menoa and pulau galau are part and parcel of NCR land. 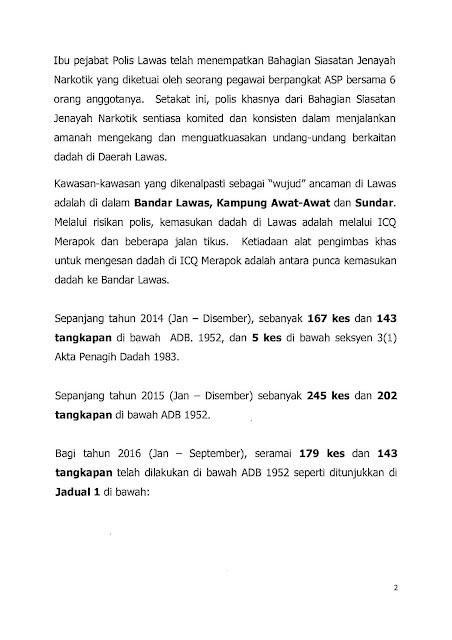 By ignoring legitimate NCR claims over pemakai menoa and pulau galau, and allowing the land authorities to continue issuing leases and provisional leases over NCR land, the government had set the ground for potential disputes between native landowners and the companies. Not only have the authorities continued to ignore the court rulings but they are also failing to respond swiftly when disputes arise over NCR claims. The failure to investigate swiftly and impartially leaves the landowners feeling isolated and helpless. Leaving disputes to be settled between the landowners and the companies, many of whom hire gangsters to intimidate the landowners, is not viable. Neither are court actions, which can take years to be heard and disposed of. The people cannot put their lives on hold for that long, and they should not be left to live under clouds of uncertainty over their land rights. Again, I reiterate my call for a Land Rights Commission to be set up, or a Land Tribunal, as suggested by the Chief Judge of Sabah and Sarawak, Tan Sri Richard Malanjum in January this year. Having been given a strong mandate by the people, I hope the Chief Minister and his cabinet will see fit to give the native landowners this avenue for registering their claims and swift resolution of their disputes. Perhaps the CM will oblige at the November DUN sitting. In the meantime, I call for a calm, speedy and fair investigation by the police and I trust that all parties will give their full co-operation to the investigation team. I was horrified to read about the cases of corruption involving students at institutions of higher learning in this country. However, it should probably not be shocking news, for this is merely a reflection of what is happening in all levels of the government of this country. The students were just doing what people in authority are believed to be doing. Corruption can only happen where there are 2 willing participants, as it takes 2 hands to clap. Can the MACC reveal whether any lecturers have been reported and investigated for accepting bribes to pass students? Action must be taken against both the giver and receiver of bribes. Lecturers who accept bribes are especially treacherous as they are responsible for unleashing upon the public incompetent ‘professionals’ who could potentially cause accidents, destruction and the loss of lives. There has been a steady decline in our education system, and our moral and ethical standards have declined at the same time. We hear of students and parents buying examination papers. University staff and researchers have been exposed for plagiarism and falsifying data. Our universities were once highly regarded and respected in the region but our glory days are well and truly over. It is sad to note that the rot that is prevalent in the government has pervaded into our institutions of higher learning. Our leaders are supposed to be exemplary but they do not walk the talk. Instead we have scandal after scandal, where the perpetrators refuse to acknowledge their wrongs and their lackeys make up excuses for their masters. Those who do wrong get away with it if they are affiliated with the ‘right’ side. It is commendable that the MACC has the initiative to conduct awareness programmes but ultimately, if our leaders are shown to be corrupt and unprincipled, all the programmes in the world will not have any impact. Students learn best by example, and the examples shown to them by their top government officials can only cultivate a cynical and skeptical attitude in them. We are failing our future generations if we allow the rot to carry on in our government. It is a mindset that we are up against now. The need to clean up our government has taken on a new urgency. Rahman Dahlan’s statement that the government will blacklist companies that sponsor the Bersih movement is uncalled for, immature and arrogant. It is tantamount to political threat and blackmail, and exposes a dictatorial streak which seems to course through the veins of most UMNO politicians. By jumping onto the Awang Selamat bandwagon, is he trying to gain some points in UMNO, considering that he may be subject to a certain coolness following the mass exodus of members of UMNO Sabah? Every person has the right of association under the guarantees of Fundamental Liberties in Part II of the Federation Constitution, in Article 10. How can the demands of Bersih for free and fair elections and institutional reforms be a threat to the security of the country? It is people like Jamal Yunos and his ‘all out war’ statements who are the real threat. It is people like him that should be arrested. Instead we have Ministers like Rahman Dahlan who choose to ignore the real aggressors and threaten a peaceful civil society movement that is acting out of patriotism for the country. Rahman Dahlan’s threat has the whisperings of a build up to the use of the National Security Act against Bersih on 19 November when the rally is scheduled to be held. If this should happen, it would only confirm to Malaysians and the rest of the world that the BN government has gone to the gutter, and that UMNO is cracking at the seams. The citizens of this country can take action to show that we understand our rights and are not afraid to stand up for the country. Bersih is taking the lead and we must stand with them to fight for the truly democratic country that we so wish for. I wholeheartedly endorse the recommendation by the 2 prominent retired judges that Tan Sri Richard Malanjum be appointed the next Chief Justice of Malaysia, and I echo the opinion of Mohd Hishamudin Mohd Yunus on the desirability of having a ‘substantive CJ’ rather on an acting CJ. Aside from the fact that Richard Malanjum has the seniority by virtue of his 10-year stint in his present position as Chief Judge of Sabah and Sarawak, he is a visionary who will be able to bring about much-needed reform to the judiciary. It was a far-sighted and determined Richard Malanjum who initiated the computerisation of the courts in Sabah and Sarawak in 2006 when he was appointed the Chief Judge of Sabah and Sarawak. His close involvement in the development and implementation of the project led to the creation of the Integrated Court Solution (ICS), which won the United Nations World Summit Award 2009 in the e-Government and Institutions Category. Members of the judiciary, the bar, parties in trials and the public have benefitted from the improved processes brought about by the ICS. That Richard Malanjum is eminently qualified for this position can be gleaned from his sound and reasoned judgments. We have the confidence that he will carry out the duties of his office without fear or favour and will uphold the principles of justice unconditionally. There can be no question about his capability to head the Malaysian judiciary. In the 53 years since the formation of Malaysia, no Sarawakian or Sabahan judge has held this position and now that the most suitable candidate is a Sabahan, we look forward in great anticipation to his appointment. We trust that the appointment of the next CJ will be based on meritocracy and fairness, free from any political interference. If for any reason Richard Malanjum is sidelined, the people of Sabah and Sarawak will understandably feel slighted. It will be another indication that we are the second cousins, and not equal partners in the Federation of Malaysia as was envisioned by our forefathers. For too long, we have been neglected and for too long, we have accepted this shameful treatment without protest. Of late, there has been much discussion about the status of Sabah and Sarawak in Malaysia, and many are expressing disenchantment with the less than honourable treatment meted out to the Borneo states by Malaya. This opening in the top ranks of the judiciary is a timely opportunity for rapprochement between East and West, not because of the need to make amends, but because Richard Malanjum is the most suitable candidate. It will be a start to Sarawak and Sabah taking our rightful place in Malaysia. 4. 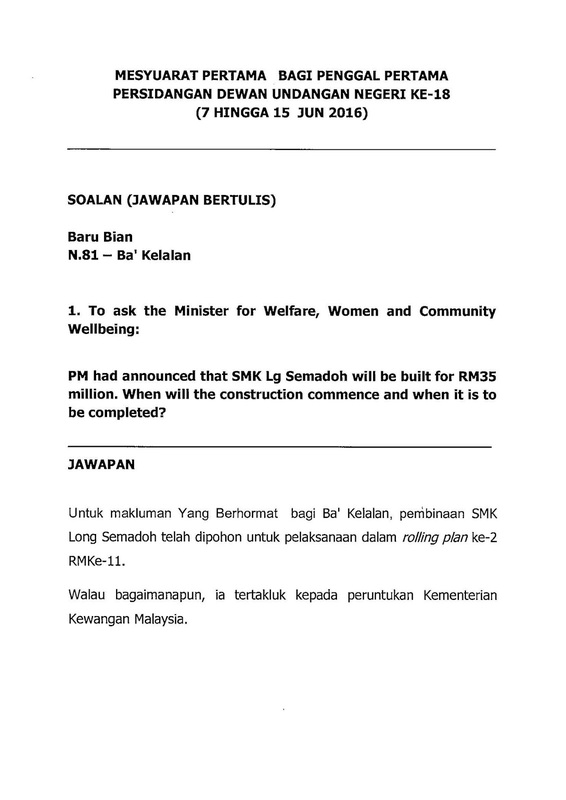 Bertanya kepada Menteri Kerajaan Tempatan:Is the construction of the Lawas Hospital on schedule and will it have residence specialists? 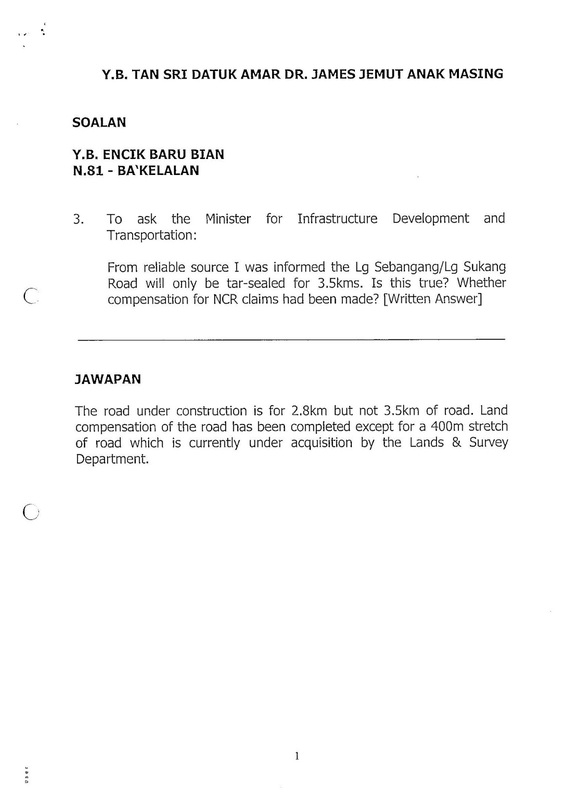 Answer: For the information of Ahli Yang Berhormat for Ba' Kelalan, Phase 2A for Lawas Hospital which involves earthworks and demolishment of buildings is completed at a cost of RM22 million. 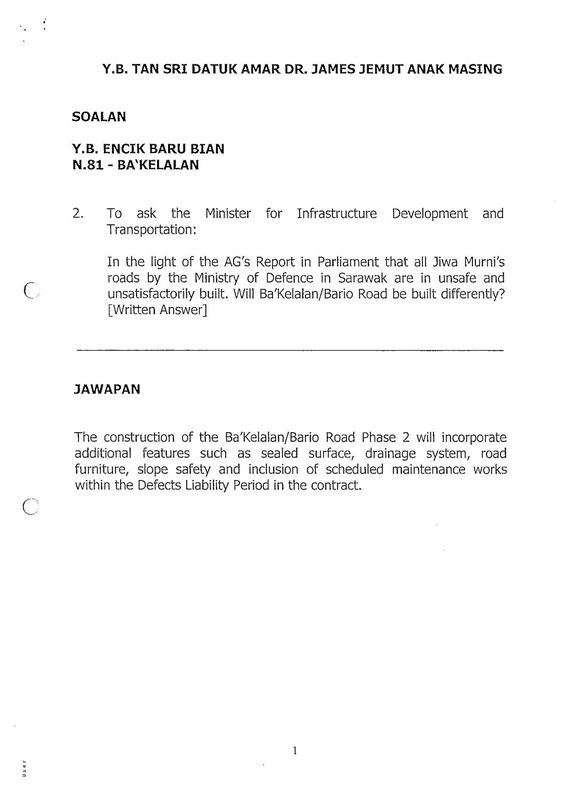 RM134 million has been allocated for Phase 2B which covers structure and building construction works. Additional funding of RM72 million is needed and awaiting approval from EPU. 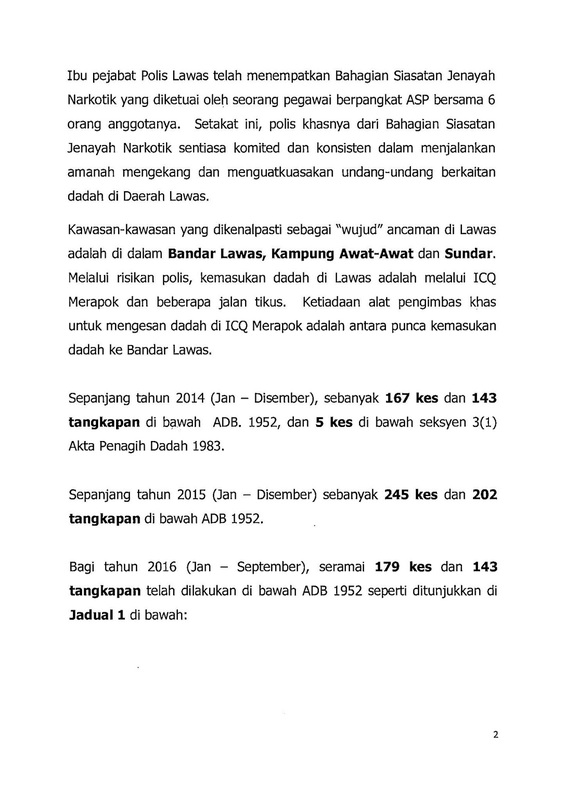 Lawas Hospital is adistrict hospital without residence specialist. However, visiting healthcare specialist facilities are provided on every 2 to 3 monthly basis namely Obstetric & Gynaecology, Medicine, Surgery, Orthopaedic, Psychiatry, Paediatric and Nephrology. PKR Sarawak strongly condemns the death threats made against Bersih 2 Chairperson Maria Chin Abdullah, Bersih Secretariat member Mandeep Singh and Hakam President Ambiga Sreenevasan. Splashing red paint on the car of Maria Chin’s son early today is a new low even for these faceless cowards. Threats against Bersih are worsening, now taking on a terrorist slant as the doctored images show. This is hardly surprising, considering how people like Ibrahim Ali, Ali Tinju and Jamal Yunus have been treated with kid gloves by the authorities and the government leaders. These people become more and more emboldened with each incident. They believe they can issue threats commit violent acts with impunity. When Ibrahim Ali called for BM bibles to be burnt, there was no action taken against him but instead excuses made on his behalf, with the AG saying it was not seditious. The UMNO-connected Jamal Yunus and his red shirts have been allowed to get away with countless acts of intimidation and violence without any consequences. Ali Tinju was arrested and released on bail for threatening Maria with violence last month, but only after an outcry from an enraged public and only a week after the incident. We have yet to know whether charges will be brought against him. We expect the IGP and his police force to take all necessary steps to trace and arrest the maker of these threats and the paint-thrower urgently, and without fear or favour. All eyes are on them now. They should show the same zeal that they apply when arresting members of the opposition for trivial matters such as speaking up on the 1MDB issue. Maria Chin Abdullah, Ambiga and the Bersih team have not committed any offences. They are merely exercising their rights and indeed, voicing the demands of Malaysian citizens, as they are entitled to under the law, on issues that are of great concern to many people. Calling for free and fair elections and justice should be encouraged and Maria and the Bersih team should be protected by the law. Bersih does not speak for just a particular section of the population, but for the whole community of Malaysians. All citizens should be outraged that people who champion democracy and justice are subject to such vile threats. The latest threat and the paint-throwing incident provide us with a test of the government’s neutrality. If no action is taken against the culprits, the public cannot be blamed if they perceive that these actions are done with the tacit approval of the UMNO/BN government. Malaysians must be prepared to bring them down in the next election if Malaysia is to have any hope of redemption. Many individuals and organisations have expressed objections to the PAS President’s Private Member’s Bill to amend the Syariah Court (Criminal Jurisdiction Act) 1965 which was listed to be read in Parliament this week. The question needs to be asked why UMNO is so amenable to this Private Member’s Bill that it gets a high ranking on the list of bills to be read. It looks like UMNO has a common agenda with PAS notwithstanding having been labeled as ‘kafir’ by PAS in the past. Nobody needs to be a genius to know that it is all for political expediency; the need to hold on to Malay support in the heartland. People have begun to realize that this bill will affect everyone, not just the Muslims as those proponents of the bill claim. This is no different to the ban on the ‘Allah’ word, which the government claimed would not affect Sarawakians and Sabahans. If this motion is passed, it will set in motion a movement to slowly and perhaps insidiously, expand the implementation of Hudud law in Malaysia. The supremacy of secular law under Article 142 of the Federal Constitution in Malaysia has been upheld in the landmark case of Che Omar bin Che Soh v PP by the Supreme Court. In that case, the court rejected the argument that the death penalty for drug trafficking was unconstitutional for offending the principles of Islam. The Lord President held that Article 3, which recognizes Islam as the official religion of the Federation, was never meant to extend the application of Syariah to the sphere of public law. We should not forget that one of the preambles in the Proclamation of Malaysia, declared by Tunku Abdul Rahman, is ‘… whereas there has been promulgated a Constitution for Malaysia which shall be the supreme law therein…’. The supremacy of the Federal Constitution is clearly spelt out in Article 4. This was the social contract to which our forefathers agreed and we must not allow it to be rewritten to dramatically alter the landscape of this country of which we are a part. In all matters of upholding our rights, and not just this Hudud Bill, we must be consistent. One crucial related matter is the issue of conversion. Regrettably, religious conviction has been politicised in this country for so long that people accept it as the norm. Religion has been legislated and policed in this country so much that the notion of religious freedom has become illusory for many. All the hurdles put in the way of Malaysians who wish to exercise their rights to their choice of religion by way of requirements for consent, counseling, attending courses are unconstitutional as they contravene Article 11 of the Federal Constitution. Given the refusal of closed-minded groups to accept these rights or even to discuss the matter, it is not surprising that opponents of the Hudud Bill such as Siti Kassim had to resort to gestures to voice their opinions. Would it be too much to hope that should the matter come up for a vote, MPs will vote according to their conscience and not sacrifice justice and fairness for political expediency?